Satiety is the state of feeling full with the food we have eaten. When you are satiated, you will experience a sense of fullness without craving more food. Diets fail because they are not satiating. A diet that doesn’t promote satiety will encourage food cravings. Satiety is the key to sustainable, long-term weight loss. Worldwide obesity and diabetes rates have more than doubled since 1980. It is important to consume foods that make us feel full longer which will help us avoid experiencing food cravings. Protein-rich foods are highly satiating. Consuming a protein-dense breakfast will help keep you full until lunch. The more nutrient-dense foods are, the more filling they tend to be. Vegetables and whole fruits are great sources of fiber that will help you feel full, longer. Plant and fish sources of fat are often very nutritious and filling. Quickly consuming meals is often related to ‘mindless eating’, where we don’t realize how much we are consuming. Slow down and give satiety cues a chance to reach the brain. Not only will drinking enough water keep us hydrated, it will also help us avoid confusing thirst signals with hunger signals. Adopting a plant-based lifestyle doesn’t necessarily happen overnight. Start slow by trying Meatless Mondays. This will help you discover meals that include more vegetables, whole grains, and legumes. This is the key to discovering delicious meals that you may have never considered before. Be open to different flavors and recipes - try ethnic cuisine or experiment with new recipes at home. Pay attention to what you’re eating and putting in your body. Slow down. Learn to listen to your body by recognizing the difference between hunger and boredom. Fruits - Any fruit! Like apples, bananas, grapes, strawberries, oranges, etc. Vegetables - Veggies are also great and an important part of a plant-based diet. Consider bell peppers, corn, avocados, lettuce, spinach, kale, peas, etc. Tubers - These root vegetables include things like potatoes, carrots, parsnips, sweet potatoes, beets, etc. Whole Grains - These are grains in their whole form. Like quinoa, brown rice, whole wheat, oats, barley, etc. Legumes - This includes things like beans and lentils. Nuts & Seeds - Walnuts, peanuts, almonds, hemp, fennel, chia, etc. are all great options! If you like eggs - great! Eat eggs with sauteed vegetables for breakfast or hard-boil them for a snack. If you like fish - wonderful! Having a meal of salmon with quinoa and broccoli/cauliflower would make a nice, well-balanced dinner. If you like chicken - fantastic! Dice some up and put it on your salad for lunch. You get the idea… Eating a plant-based diet is more about shifting the focus from the meat of a meal to the plant-based options listed above. Try some new foods and have fun with it! **Steaming is a much gentler way to cook spinach as it wont come into contact with cooking water. Eat your spinach! Whether cooked or raw, spinach contains many benefits and essential nutrients that our bodies need. Try it both ways and get all those great nutrients that spinach provides! Breakfast is a great way to start your day! Breakfast plays an important role in school performance related to cognitive function. Students will be able to focus better and their brain will have the nutrients it needs to function adequately. Those who consume breakfast regularly, especially a breakfast high in protein, will feel full longer. This will help to avoid overeating and excessive snacking throughout the day. Consuming a balanced breakfast leads to an increase in nutrient intake helping us meet our goals for daily vitamin and mineral consumption.. When breakfast is consumed regularly, studies have shown that a higher level of wellbeing is developed. Breakfast starts the day on the right note. This will lead to better, healthful choices throughout the day. 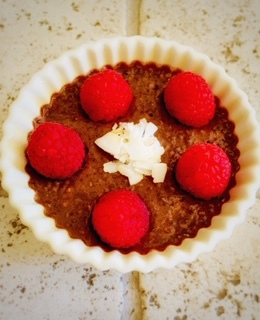 Chocolate Chia Seed Pudding topped with raspberries and coconut. Whisk together cocoa powder, maple syrup, cinnamon, salt, and vanilla to make a paste. Gradually add coconut milk while continuing to whisk until smooth. Transfer to container (I use a mason jar), cover, and refrigerate overnight. Serve chilled with desired toppings and enjoy! In March, we dedicate our attention to all things nutrition, this year the Academy of Nutrition and Dietetics will honor National Nutrition Month as its own theme. In March of 1973, ‘National Nutrition Week’ was initiated. National Nutrition Week was embraced as a way to deliver nutrition education messages to the public while promoting the profession of dietetics. In response to the growing public interest in nutrition, the week-long celebration was expanded to become a month-long observance in 1980. To increase the public’s awareness of the importance of making informed food choices and developing sound eating and physical activity habits. National Nutrition Month promotes the Academy and its members as the most valuable and credible source of current, evidence-based food and nutrition information. RDN Day is also celebrated during National Nutrition Month, on the second Wednesday in March. This occasion increases awareness of RDNs as the indispensable providers of food and nutrition services, while recognizing RDNs and Nutrition and Dietetic Technicians, Registered for their commitment to helping people enjoy healthy lives. RDs are one in a melon! Show your RD friends some love and a-peach-iation! Promote healthful messages and achieve the Academy’s vision of a world where all people thrive through the transformative power of food and nutrition. 1. Make half your plate fruits and vegetables. Fruits and veggies add color, fiber, flavor, vitamins, and minerals to your plate. 2. Watch your portion sizes. Get out some measuring cups and see how close your portions are to the recommended serving size. 3. Experiment for more plant-based meals. Vegetables, beans, whole grains, nuts, and lentils are great substitutes for meat and can be better for your overall health. 4. Drink more water. Hydration is an important part for your body and skin. 5. Be active. Physical activity has many health benefits. Start with just 10 minutes at a time and work your way up. 6. Get to know your food labels.Reading the nutrition facts label can help you shop, eat, and drink smarter. 2. Chop cauliflower and onion, set aside. 3. Peel the outer skin of the garlic, leaving the cloves intact. Cut the tips off the head of the garlic and place it on a baking sheet, along with the onions and cauliflower. Drizzle with avocado oil. Season with salt and pepper. 4. Bake 400 degrees for 30-40 minutes until the cauliflower is tender and lightly browned. 5. Place cauliflower, onion and garlic in a large pot. Squeeze the garlic bulb to express garlic. 8. Add salt to taste and place over medium heat. 5 Things to focus on to achieve your goals! 1. How much are you eating? You should be eating until you are satisfied, instead of stuffed. Pay attention to your portions at each meal. 2. How are you eating? 3. Why are you eating? Are you hungry, bored, stressed, following peer pressure, social cues, thirsty? Eating for the right reasons is key - you should be eating out of true hunger. Take time to reflect before grabbing the first thing you see in the cupboard. 4. What are you eating? Minimally processed proteins, meats from grass-fed sources, a variety of colored veggies, fiber-rich fruits, healthy starches and whole grains, and healthy fats like nuts and avocados. 5. Are you being honest with yourself and are you being consistent? Really focus on the how much you are eating and the what you are eating before moving on. Try logging your food to take a better look. We have our clients take pictures of what they eat so we can take a better look and work together to make the best choices to get you to your goals. Want to work with us? Book a free phone call to learn how we can help you. Although Spring is right around the corner, the weather outside still very much feels like Winter. When the weather is cold, our bed and couch become a lot more attractive than the gym. It is extremely common and completely normal to lose our “fit-spiration” during the winter. However, it is very important to get at least one form of exercise every single day – even in the winter! We know how difficult it is, so here are some tips to make it a little less challenging to get one’s self up and moving in the cold. A highly popular trend in the fitness world is group workout classes. From kickboxing to aerial yoga, one can find a class for just about any kind of exercise. There are many benefits to taking a workout class. A trained instructor provides constant motivation and strives to push the student to his/her greatest potential. Whether one is a competitive type or just likes to have fun with a workout, the group aspect of the class can appeal to both of these attitudes. The combination of the group atmosphere and instructional aspect of the class guarantees that one gets an effective workout, which does not always happen when working out on one’s own at the gym. Because workout classes are offered at specific times, one must add it into his/her schedule. Also, most workout classes cost money. The scheduling of the class as well as the price are great incentives to force one’s self to go. A downside of workout classes for most is their sometimes extreme prices. However, the online workout video trend allows one to get a similar workout without paying any money at all! The internet is full of free, fun, challenging workout videos. Simply research a certain type of workout, a body part to focus on, etc. and chances are there will be hundreds of results. If the group aspect of the fitness class is what one craves, he/she can invite friends to do these workouts together! One can get fit and have fun, all without leaving home. Every regular gym-goer dreads the ‘New Year Resolution crowd’ that crowds the gym during the month of January. However, there is a positive (though disappointing) aspect to this influx. As winter continues on, this stampede will fizzle out, leaving the gym as spacious as it was before the start of the New Year, if not less full. Take advantage of this halt in common gym attendance by going during these empty winter months! A panic often runs through our veins as the snow starts to melt and we think about summertime while remembering how little we exercised during the winter. Avoid this anxiety by getting a head start. A fun and easy way to stay motivated is planning and goal setting. Like scheduling a workout class keeps one motivated to show up and do it, putting a workout in the calendar as an event with as much priority as a meeting or a social event will help to do the same. Creating long-term fitness goals that span the entire winter will allow one to stay motivated. A sense of seasonal depression sets over many of us in the winter as daily life feels much more difficult. Curb this dreaded feeling with fitness! Exercise releases endorphins in the brain which cause us to be happy and lively. Constant exercise promotes a regular, healthy sleeping pattern, which also greatly contributes to overall mood. Whether one is doing a pilates video at home or taking a daily yoga class, remember to follow these tips to get up and get moving during the winter! As we watch the Patriots play in yet another Super Bowl this Sunday, most of us will be celebrating by watching with friends. However, along with these Super Bowl viewing parties come unhealthy dietary choices. One of these choices in particular is alcohol. Though fun and seemingly harmless in moderation, alcoholic beverages can pack a massive amount of un-needed calories. Below are some helpful tips to follow to keep yourself in the clear while drinking. 1. Stay away from drinking games. Though fun and a great way to get everyone at the party involved, drinking games are an easy way to drink way too much, too fast. Avoid this over-consumption by participating with water instead of alcohol, or just watching your friends play while cheering them on. 2. Choose your drink wisely. Mixers are a very easy way to pack in hidden calories. Stimulants such as Red Bull can be dangerous to mix with alcohol because of the unhealthy neurological effects as well as the dietary. While energy drinks stimulate your body, commanding your brain to speed up, alcohol is a depressant, slowing the function of your central nervous system. This counteraction is a recipe for disaster. Not to mention, these energy drinks are loaded with sugar. Juices, sodas and syrups are also popular mixers with unwanted calories and sugar hidden inside. Stick with soda water or small amounts of liquor simply on the rocks. Another safe option is to add extra ice – or request it if you are ordering at a bar. Filling the glass with more ice than the drink is a good way to keep yourself in the safe zone. The higher the proof of the alcohol in your drink is, the more calories it holds. Some of the healthier options include vodka sodas, gin and tonics, red and white wine, and light beer. 3. Alternate alcoholic and non-alcoholic drinks. Drinking a water in between each alcoholic drink is helpful because it keeps your body hydrated and forces you to slow down. 4. Make a game plan. Eat ahead of time! Consuming a large, healthy meal will not only allow the alcohol to settle better in your stomach, but if you are full, you are less likely to fill up on drinks. Set a limit for yourself on the amount of drinks you will allow yourself to consume, as well as the types of drinks. Plan your eating as well. Sometimes, we eat foods after drinking that we would not eat if we were sober. If you know you will be surrounded by unhealthy food (which will most likely be the case at a Super Bowl party), and you feel you will not be able to resist these foods after you drink, skip the alcohol! What is plant based eating!? 1. A plant-based diet can help prevent disease. True or False? Answer: True. A meat-based diet's high fat (especially saturated fat), low-fiber content contributes to obesity, diabetes, certain cancers, and heart disease. A plant-based diet, along with adequate exercise, can help prevent these diseases. 2. A plant-based diet is a vegetarian diet. True or False? Answer: False. A plant-based diet consists mainly of vegetables, fruits, grains, and legumes, with modest amounts of meat. The key is to take the focus away from meat, making it a side dish or condiment instead of the main entrée. 3. A plant-based diet won't give me enough protein. True or False? Answer: False. As long as you eat a variety of foods, you should get an adequate amount of protein in your plant-based diet. 4. Legumes (beans and peas) are a good meat alternative. True or False? Answer: True. Legumes provide protein and iron, making them a good nutritional substitute to meat. They are also a good source of fiber. Use them in place of meat in chili, burritos, lasagna, and soups. Serve them over rice or pasta or add to soups and salads. 5. Simply avoiding or cutting back on meat makes for a healthy diet. True or False? Answer: False. Cutting the meat in your diet doesn't automatically make it healthier. Be sure to add healthful foods in its place. French fries and macaroni and cheese may be meatless, but they are not low in fat. Be sure to eat at least 4.5 cups of fruits and vegetables, plus a variety of whole grains daily. 6. I'll have to shop in expensive stores to follow a plant-based diet. True or False? Answer: False. Compare the cost per serving of beans, rice and pasta with meat and you can see how inexpensive a plant-based diet can be. These items, plus fruits and vegetables, are available at regular supermarkets. Try chicken, turkey, and fish in place of red meat; they are lower in saturated fat. When you do use meat, mix it in casseroles and stir-fries, with lots of vegetables and pasta or rice. Think of meat as a condiment. If you have a family of meat-eaters, try one or two plant-based meals per week until they get used to new flavors and foods. Introduce beans as a side dish, gradually moving toward bean-based entrees. Whether you are on a business trip in the Middle of Nowhere, U.S.A. and fast food is your most gourmet option, or on your honeymoon in Paris, surrounded by pastries and wine, maintaining a healthy diet while traveling can be difficult and feel impossible. However, we promise, it is not. While balance is essential and there are definitely cases when you absolutely must eat that gelato in Florence, overall, a nutritious diet and optimal health are most important, no matter where we are. The main places where healthy eating habits go awry while we travel are the airport, the hotel, restaurants and the bar. Do not fear, we have the tips and tricks to keep you on track toward optimal health while you are on vacation without sacrificing your fun. · Most foods do in fact pass through security, so pack at home. This option will save you money and set you up for success as your temptation to indulge in an unhealthy snack at the convenience store will be eliminated. Fresh fruits and vegetables paired with peanut butter and hummus, unsalted nuts and granola are just some of the many ways you can make sure to keep healthy while flying. · Finding a healthy pre-flight meal may be difficult. Depending on how much time you have, try and decide whether you really must eat at the airport or if you actually can make something at home and eat before you go! If not, here are some tips to take into consideration when choosing your airport meal. · Skip the junk food sides like chips or a cookie. · Flying is already an extremely dehydrating activity so definitely steer clear of salty foods if possible. · If you are in a rush, do not force the meal down in the five-minute window you are allowed to sit. Bring it on the plane and enjoy it at a normal, relaxed pace. · Figure out which terminal you will be spending your time in before arriving to the airport and gage what your options will be. This way, you will not feel overwhelmed by the plethora (or lack) of options. · Try to eat a balanced meal. · Stay sober and stay hydrated – drink more water than usual if you can. · If your options are not the best, be prepared for boring. But, this one boring meal is a minor set back compared to the vacation filled with fun and delicious food that awaits. · Do not waste your calories on liquids – skip the juice. Opt for unsweetened tea, coffee or water instead. · Walk through without a plate first. This way, you can take into consideration what all of your options are so you can make sure to not get hasty and grab one of everything you see. · Skip the pastries. Starting the day with sugary carbs filled with empty calories will leave you feeling sluggish and in a bad mood before lunch. · Take advantage of the fruit. A typical feature of most breakfast buffets is a wide variety of beautiful fruit. Load your plate with as much colorful fruit as you can. · Choose your spreads wisely. Spread a nut butter on your toast rather than a sugary jam or butter/cream cheese. · Make sure your grains are whole grains. · Do not take the term “All You Can Eat” literally. · If you know you will be eating a heavy dinner, go light at breakfast and lunch. Make sure snacks are light and healthy. · With modern technology, nearly every menu is on the internet, available for you to read. Make sure to give it a look before going out to eat so you can plan ahead and weigh your options before you get there. · Either ask the waiter to skip the bread basket or resist your own temptations and skip it yourself. · When ordering a drink, avoid alcohol. Your best friend is water. However, if you do choose to order alcohol, try to pick a light beer, a glass of wine, a simple martini or a vodka tonic. · Read between the lines. Steer clear of the words creamy, breaded, crisp, sauced, stuffed, buttery, sautéed, pan-fried and au gratin. These nearly always mean: calories. · Remember that each meal should be a balanced meal. For a rule of thumb, vegetables should be ¼ of the meal, protein should be ¼ of the meal and grains should be ¼ of the meal (the remaining ¼ is reserved for fruit). · Add as many vegetables as you can, whenever you can. Order a delicious side of vegetables, a side salad or start with a salad. · If a meal comes with fries or chips, ask for a healthy side instead. · Salad Tips - Always ask for dressing on the side and pour with extreme moderation – a little goes along way. Restaurants love to load up on the dressing and it usually packs a lot of calories. · A fun trick is the fork dip. Simply dip your empty fork into the dressing, then put your fork into the salad. Surprisingly, this provides the perfect amount of dressing for taste and health! Avoid creamy dressings, bacon and other salty meats, croutons and large amounts of cheese. · Take advantage of the restaurant’s obligation to keep your water glass filled and drink a lot of it. This habit will help you pace yourself throughout the meal. · Just because a restaurant serves a huge portion does not mean you must eat it all in one sitting. · Bring leftovers back to the hotel mini fridge and eat them for lunch the next day (money saving). · Eat slowly. Your brain does not tell your stomach that you are full for twenty minutes. Not only will you end up eating a proper amount, the meal will most likely be more enjoyable as you are not rushing. · No matter how amazing the crème brulee looks, you can live without it. Skip dessert. You will be happier and healthier for it. In certain settings, alcohol can be a big part of a vacation, as well as a large hindrance on your health. Always remind yourself that you will have fun if you choose not to drink and prioritize your health. Alcohol is acceptable if consumed responsibly and in moderation. · Eat food while you drink. · Take small sips and make the drink last longer. · Drink a glass of water in between each drink. · Skip the bar snacks. · Pre-plan your post-drink meal. Keeping all of these tips in mind will send you in the right direction. Above all, never take opportunities for granted while traveling. Have fun, indulge when you want to – but in moderation! Happy travels! ‘Gluten-free’ has erupted in the United States with the rise of Celiac disease and gluten sensitivity. With that, gluten-free has become synonymous with healthy, which is in fact untrue. Like most foods, if you take something out you need to replace it with something else to still make it palatable. Eliminating gluten from breads, pasta, cereal, baked goods, etc. is replaced with sugar and oils high in fat. It is important to read the nutrition label of gluten-free foods to determine if it’s the best alternative before purchasing. Major food companies know better than anyone else on how to successfully market food. With the rise of health conscious Americans, food companies selling nutrient dense and high calorie products needed a new way to make their food products more attractive to sell. ‘Low-fat’, ‘no-sugar’, ‘zero calorie’ are the grab-bag of terms that are placed on the front of packages to market foods today. When something is taken out of a food product like fat for instance, sugar is replaced. The product may be low in fat, but now it tripled in sugar content. Always always look at the nutrition label before buying food. Be a smart shopper and don’t get fooled by food marketing. It’s hard to believe for most people, but juice isn’t as good as it seems…Popular brands of apple juice, orange juice, grape juice, cranberry juice, etc. are strikingly high in sugar content. This concentrated sugar is not good in high consumption and can cause cavities and weight gain over time. Energy and high protein bars were created for athletes to give them a boost of calories during a high intensity workout. Individuals of all energy levels are purchasing these bars as a snack food, giving them a high dose of sugar and calories. Energy bars are the equivalent to candy. The high carbohydrates in the bars are to be easily absorbed by athletes who need calories during high physical activity. When looking for a granola bar to snack on, look for the brands with lower calories, sugar, and fat. Americans consume diet sodas in staggering amounts. What they fail to believe is that diet sodas and diet drinks are doing them more harm then good. Diet sodas contain no nutritional value, which means you are not drinking any calories. What your drinking, is a drink loaded in artificial sweeteners. Artificial sweeteners, like aspartame, have more intense flavors than natural sugar and may have a negative effect on your health. Dietitians vs. Nutritionists…What’s the Difference Anyways? Nutrition is the new buzzword heard from the mouths of all Americans today. With the rise of obesity, diabetes, and other chronic health conditions, Americans are looking to lead healthier lifestyles to steer clear of these unwanted health burdens. There’s a spotlight on health and what it means to be healthy and we all want to be in the know. With little to no knowledge on what it means to be healthy, people are doing what they do best to get answers: Google…we’ve all done it, trust me. With a simple search on nutrition, two titles are bound to pop-up: dietitians and nutritionists. Who’s who and what’s the difference between these two roles anyways? You must complete a bachelor’s program in Nutrition and Dietetics from an accredited college. Coursework involves classes in the sciences such as chemistry, biochemistry, biology, anatomy and physiology and an array of nutrition courses. They must complete a competitive internship before they become a Registered Dietitian. Through this internship, they gain experience in clinical nutrition, community nutrition, food management and entrepreneurship. They must pass a national registration exam and become licensed in the state they want to practice in. They must maintain their credentials through continuing education units (CEU) to maintain their professional license as a dietitian. No specific education is required and no accredited title is given. Could be someone who has their PhD or someone who has taken a basic nutrition course. Always ask a nutritionist about their training before receiving advice. Many unqualified people use this title in the nutrition field and you should be wary when choosing a nutrition professional for health advice. This spicy salsa is irresistible and simply simple. This nutritious recipe is full of colorful ingredients and is loaded with antioxidants. Serve on a pork roast or baked chicken, or use it as a dip with blue corn chips or whole-wheat crackers. It’s one of those recipes that is perfect for cookouts and snacking, and is guaranteed to spice up your summer! Combine all the ingredients. Stir well and serve! Who are these magical people who are trained to navigate the world of food and nutrition without freaking out and help others do the same? And do they, like, never eat carbs? To answer these questions and others, BuzzFeed Health reached out to four registered dietitians. 1. They aren’t interested in judging your diet or lifestyle. Even though it might be intimidating to tell a nutritionist all about the way you eat, especially when you’re seeking them out for help with your diet, nutritionists aren’t there to guilt or shame you into changing your diet. “I hate being the food police,” says Sit. Plus, shaming a patient doesn’t help, says Jones — it’s disempowering. 2. There’s no one diet they think is superior. Yes, across the board they’ll probably advise you to drink less soda and eat fewer processed foods. But they’re not likely to advocate going Paleo or going vegan or avoiding all grains. “Everything has to be very individualized. … My approach is to find what’s best for you and your body, and what will make you feel good and not stressed or anxious about eating,” says Jones. 3. They won’t tell you to say goodbye to all the things you love in this world. Jones explains that working with a nutritionist isn’t about eliminating your favorite (but less than ideal) foods from your life. If you love Popeyes, she won’t tell you to ban it. She’ll probably recommend you have it only once in a while, and with lots of vegetables. Redmond says that a big part of her job is making over people’s favorite recipes to be a little healthier — whether it’s a dessert, cocktail, or favorite party food. And she’s not even trying to make these recipes totally fat-free or sugar-free, just kinda not as terrible for you. “The last thing we want is for people to take a bite and have it taste like a diet,” she says. 4. And, yes, they do want to help you start to enjoy healthier foods, too. “Dietitians don’t want to make your life miserable. We really want you to understand food and appreciate it,” says Langer. It’s about helping clients “find balance between ‘healthy’ and ‘happy’ foods,” says Sit. 5. They got into nutrition because they love food, not food rules. “I always tell people, most of [the people in] our profession, we really do like food. We like to celebrate with food. We like food itself,” says Redmond, who was so into food she was actually enrolled in culinary school until she realized that she’d rather teach people how to cook their own food than become a professional chef. “I didn’t have dolls growing up, I had pots and pans,” she says. “I wanted to teach people to eat what they already love.” Similarly, Sit was also training to become a chef until he realized he wanted to study nutrition instead. 6. And they don’t eat super healthy 100% of the time. Sure, they eat all the vegetables, but they also let themselves have their favorite things (in moderation), like sweet stuff, fried chicken, and the occasional double whiskey. And this can actually make them better nutritionists, says Jones. “I can relate to people because I have had — and I still do have — my own struggles,” she says. 7. Clients who are mega self-educated about nutrition are kinda hard to deal with. Sit says that it can be difficult to work with clients who have done a bunch of their own nutrition research, whether they’ve googled something to death or watched every food-related documentary on Netflix. Doing all that research gives people lots of facts and subsequently lots of opinions about what’s right for them, but not necessarily the ability to “step back and look at the big picture” of a person’s diet, lifestyle, and relationship to food, which is exactly what nutritionists are trained to do. 8. They basically have a sixth sense for when clients aren’t being totally forthcoming. Langer says after 17 years as a dietitian, she can usually tell when someone is trying to find a way not to mention the major sugar bender they just went on or that they had a less than ideal weekend in terms of eating or drinking. Another telltale sign: when a client isn’t making progress toward their goal and there doesn’t seem to be any reason why. 9. They don’t want to talk nutrition while they’re socializing. When people know you’re a nutritionist, they’ll want to debate diets or get advice about the way they eat, says Sit. “I never tell people I’m a dietitian. It’s brutal… I have no interest in engaging in work in a social situation,” he says. Langer agrees: “When I go to a party I don’t want to tell people what I do for a living because I get bombarded with questions. I’m not working, I don’t want to hear what you had for breakfast,” she says. There’s a ton of information out there, and Langer says that when it comes to nutrition, people are “so wedded to what they believe in” that they often want to prove that their food thing — whether it has to do with GMOs, cleanses, supplements, etc. — is the best or the right thing for everyone across the board. “I try not to go there with people,” she says. Jones agrees: “I don’t have any interest in convincing people of anything they don’t want to hear,” she says. 11. Nutritionists can also help with some of your ~feelings~ about food and eating. “I’ve had so many people cry in my office. A lot of the time nutrition is not about food; it’s about why you eat and how you eat and what’s happened in the past to affect your attitude towards food,” says Langer. She says that when clients come to her wanting to lose weight, it’s important to understand not just the way they eat, but what their attitudes are about food and themselves. “Some of that stuff is painful for people,” she says. Of course some clients’ issues are beyond the scope of what a nutritionist can provide. For example, a client with more serious emotional issues around food, eating, and weight would need to be referred to an actual psychotherapist, Langer says. 12. They’re not super into how other health care professionals deal with food and nutrition. 13. And, yes, they know exactly how to lose 10 pounds super fast. It’s one of the first things people ask nutritionists, says Jones, and that’s why they have a jokey answer. “You amputate a leg. That’s the quickest way to lose 10 pounds,” Jones says. The fact is, nutritionists are not the people to go to for advice on which crash diet will help you drop the most weight in the least time. That’s because what they’re interested in is helping people make small changes that add up, over time, to a healthier lifestyle, an enjoyment of food, and a more empowered, self-confident outlook on life. We really love this article and think you will too! This is ONE of the reasons we offer corporate wellness and believe strongly in it! A cute little video on some healthy party hacks! Tips on organizing your fridge during the Holidays!